Among the critical factors (fuels, weather, and topography) of the fire danger and behavior, fire weather is the most dynamic and the least expectable. It is very necessary to know current and forecast weather for all fire coordinators and firefighters. TFS predictive service staff work with National Weather Service forecasters to determine areas of extreme fire danger by assessing forecasted temperatures, relative humidity and wind speeds. In addition, conditions of wildland fuels are observed and used to calculate and predict fire behavior. 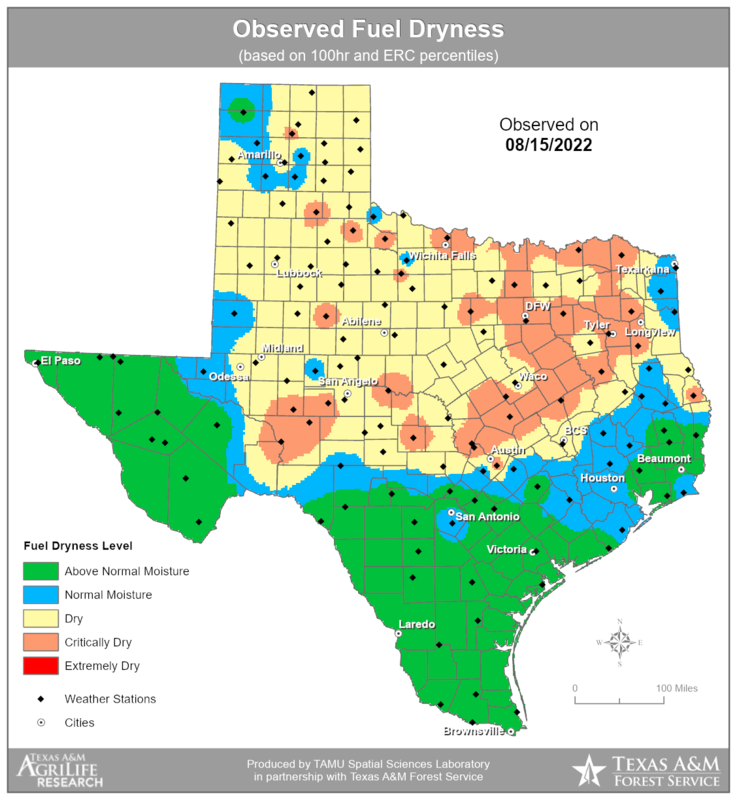 Each region of the state contains a dominant fuel type—grasses, brush and trees—that Texas A&M Forest Service must consider when assessing risk. Factors such as the level of drought; percentage of rainfall; how quickly the grasses, brush and trees dry out; and how readily they will ignite and burn are all calculated and considered. Fire weather watch or red flag warning is issued when the combination of dry fuels and weather conditions supports extreme fire danger. This alerts local land management branches about the onset, or possible onset, of serious weather and fuel moisture conditions that could cause rapid or dramatic increases in wildfire activity. When a Red Flag Warning or Fire Weather Watch is issued, the Fire Weather layer color of the NORR Fire Weather maps turns red or orange. Depending on the weather operating plan of Texas, Red Flag criteria are vary from region to region. The Texas Fire Weather Operating Plan (PDF, 941 KB) descripts more detailed criteria of each region. For investigating local weather conditions, please check out the TICC-Fire Weather website. All fire managers and fire weather forecasters rely on weather data from Remote Automated Weather Stations. These weather stations complete with satellite uplink capabilities provide crucial information for state and national datasets. The data is used to produce a number of daily products, such as Daily Fire Danger Forecast, Drought Index and Current Fuel Moisture maps. Texas A&M Forest Service Predictive Services staff use more than 80 RAWS throughout the state of Texas. Detailed fire weather information for these stations can be accessed from Texas RAWS. Fire Outlooks provide an assessment of expected wildfire potential over periods of a week, a month or seasonal as required to improve information available to fire management decision makers. These assessments are designed to inform decision makers for proactive wildland fire management, thus better protecting lives and property, reducing firefighting costs and improving firefighting efficiency. TFS Predictive Services staff generate Fire Potential Outlook (PDF, 1MB) and Risk Assessment. More information can be found at Texas Interagency Coordination Center.